Enter certificate recipient name and e-mail. The certificate will be sent to this e-mail address. Enter additional certificate recipient name. The certificate will be sent to main certificate recipient e-mail. Tick checkbox to choose Gift Card style. Hover over thumbnail to preview and Click on button to select it. Check the box if you wish to personalize gift certificate. Enter your message (up to 250 characters). It is printed on gift certificate as Message. I agree that this certificate is not redeemable for cash. 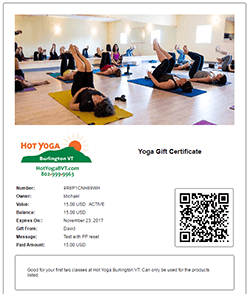 The certificate can be redeemed at the BurlingtonHotYogaVT studio for the purchase products and services.